1. O'Brien Solo Screamer 56"
Designed for the smaller, seated or prone rider. 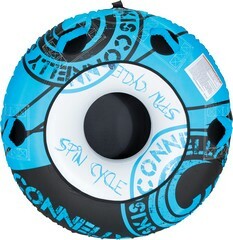 The Spin Cycle is our least expensive, smallest tube. The benefits are that it can be ridden by a smaller rider, is easier to climb aboard and has a lot of value for the money. Not for use by kids under 13!!!! 4 padded handles with knuckle guards, Boston Valve, Webbing tow loop.